Pascal Schipper regularly advises french and foreign entities on legal issues related to banking and financial regulation. His area of expertise includes both litigation and financial market transactions matters. Pascal has developed specific expertise in the implementation of antibribery management systems (Sapin II) within large French corporations. 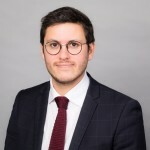 He also regularly advices on relocation project of foreign investment firms in France in the context of Brexit and new MiFID 2 regulation, and matters related to banking secrecy. French native speaker, Pascal is fluent in English.